You should decide partition type before creating new partition table. There are three types of partitions, primary partition, extended partition and logical partition. Primary partition is created on hard drive directly, which is generally used to install and boot operating system. Due to the limitation on MBR partition table, there can be 4 primary partitions at most, or 3 primary partitions and 1 extended partition. Extended partition is a kind of special primary partition, and it can contain several logical partitions. Logical partition is created on extended partition, and the number of logical partition is not limited. Step 1 Select free disk space on hard drive and click New Partition button from toolbar and Create New Partition window will pop up. Step 2 Select partition type, file system and partition size and click OK button. 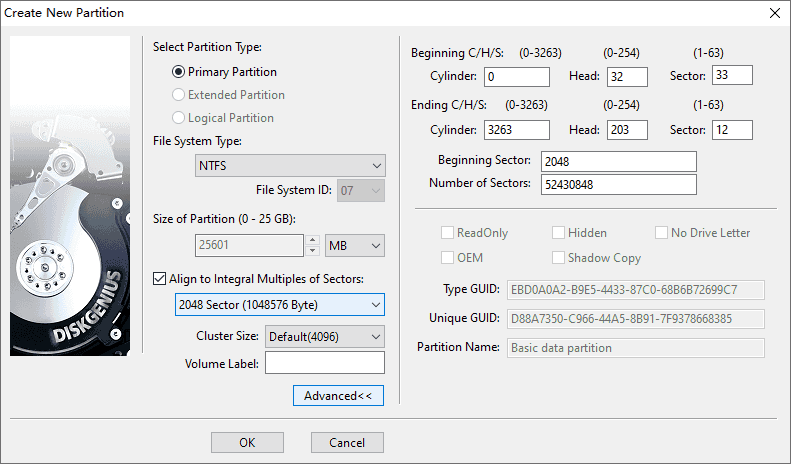 To make sure the partition is 4K aligned you can select option "Align to Integral Multiple of Sectors". You can set partition's beginning and ending cylinder, beginning sectors and sector numbers. As to GUID partition table, more partition settings are available. Step 3 Click Save All button to save the partition to partition table and format the partition. The newly created partition is not saved to hard drive immediately, as it is created in memory for the moment. Thus, you need to save the partition to partition table manually before you can see it in Windows Explorer. Such approach is to prevent data loss caused by improper operation. DiskGenius is able to create a partition on existing partition by splitting one partition into two without data loss. Step 1 Right-click on a partition and select Create New Partition from context menu. 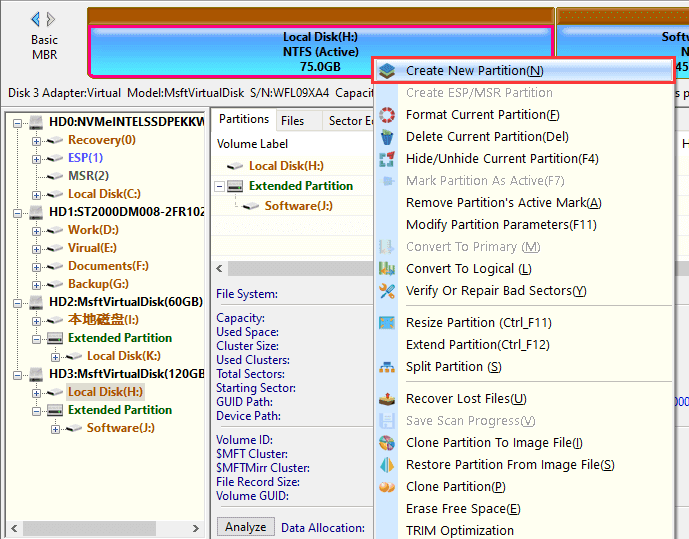 Step 2 Enter partition size for these two partitions and click Start button.